Located about 12 miles due south of Ann Arbor, Michigan, Milan real estate was home to more about 5,800 people in 2011. The city itself resides in both Monroe and Washtenaw counties, with the majority of its land area and population on the Washtenaw County side. A man named John Marvin is credited with being the city’s first settler, erecting a dual-purpose log cabin to serve as his home as well as a general store in 1831. The primarily agricultural area remained nameless until 1833, when a post office was established and the postmaster hung the unimaginative moniker Farmersville on it. The city went through two more name changes in its first five years of existence, until the U.S. Post Office finally put the kibosh on the changing nomenclature in 1836, declaring the village be named Milan after a nearby township of that name. 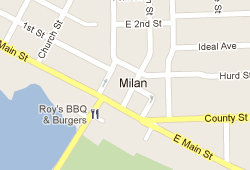 Milan maintained a village designation until its incorporation as a city in 1967. Milan, MI real estate, with its close proximity to Ann Arbor and the western suburbs of Detroit, offers residents and visitors a cornucopia of diverse and eclectic shopping and dining alternatives. According to the Milan area Chamber of Commerce, the city is home to more than 300 storefront and non-storefront businesses. Here you will find large retail shopping malls, with national chain stores and restaurants, and numerous unique local boutiques, shops and eateries. Collins Center has been a popular spot in town for nearly 30 years, offering musical instruments, craft items, clothing, electronic repair services and more. Also check out Kroger Food & Pharmacy, Latham’s Downtown Hardware, the Diamond Setters, and other Milan shopping destinations. Nature Park: Eleven acres of fun, featuring a baseball field, BBQ grills, a picnic pavilion and a dinosaur-themed playground. Sanford Road Park: Nearly 140 acres of farmland were reclaimed in order to develop this diverse park, which contains an equestrian center, youth soccer club and a 2.5-mile path for those desiring a walk, jog or bike ride among the picturesque natural areas of the park. Wilson Park: Lying on the scenic banks of the Saline River in the shadow of Milan’s quaint, historic downtown, this 35-acre park features a large playground, basketball and sand volleyball courts, baseball and softball diamonds, a soccer field, and several BBQ pits. Wilson Park also plays host to popular city events, such as the annual "Concerts in the Park" series, Milan Fair and "Relay for Life." A lazy drive along Milan’s shady, tree-lined residential streets will show you that the neighborhood’s homes are primarily of the turn-of-the-century, two-story vintage. Approximately 25 percent of Milan’s houses were constructed prior to World War II, and another 20 percent went up between 1940 and 1959. Downtown Milan is an architectural nerd’s dream come true. Amazing examples of International, Art Modern, Italianate and other building styles have been lovingly preserved, earning the area a spot on the prestigious National Register of Historic Places. Milan, MI real estate includes one of the most popular attractions in the Monroe and Washtenaw county region: The Milan Dragway, a quarter-mile drag racing venue that plays host to several NHRA-sponsored drag racing and related events. Milan Area Schools is the administrative body for Milan’s two elementary schools (Symons and Paddock), a middle school and a high school, in addition to an early childhood center and adult education programs. Residents and visitors to Milan have a number of medical care centers and hospitals from which to choose, including St. Joseph Mercy Saline Hospital (about eight miles away in Saline), St. Joseph Mercy Hospital (about 14 miles away in Ann Arbor), Herrick Memorial Hospital (about 15 miles away in Techumseh), and the University of Michigan Health System in Ann Arbor. Transportation in and around Milan, MI can be accomplished mainly via roadways including Highway 23 and the nearby interstates 94 and 275. Other modes of transportation include Across Town Cab, which serves much of Ann Arbor’s surrounding communities, Detroit Metropolitan Airport and Amtrak train service out of Ann Arbor. If you are thinking about buying Milan real estate or selling a home in Milan, give us a call at (734) 996-0000 or send us an email to explore your options and to find out when is the best time for you to make a move.